Looking for the perfect accessory that's both floral and full of protein? 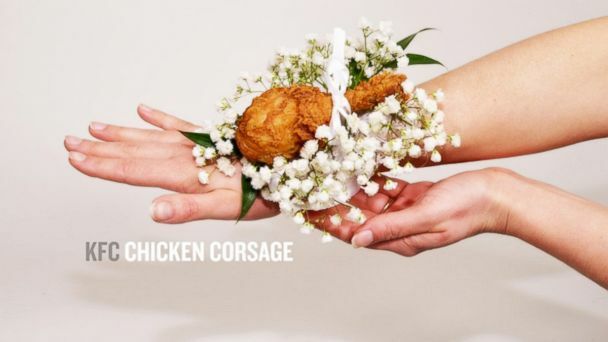 KFC has a solution for you: the chicken corsage and - surprisingly - it's not a belated April Fool's joke. The company has joined forces with Louisville, Ky., based florist Nanz & Kraft to create a truly memorable accessory composed of baby's breath flowers and fried chicken. There have already been 20 orders for the accessory and even a request from a wedding party in Kentucky, said Rick Maynard, a KFC spokesman. "We'll probably end up catering that one just so guests don't end up eating the corsages," said Maynard. Customers can order the corsage online. Although the chicken is not included, customers get a $5 KFC coupon they can redeem for a drumstick. Either attach the drumstick to the flowers or have a snack before the big event - the choice is yours.